There is another one of these somewhere, when I find it I'll merge the threads. Meanwhile, kickoff here with more UK Flooding. A 200 year old pub was washed away! ACCCKKKK! Patrick Sawer Parts of Britain suffered further flood misery as at least two rivers burst their banks, writes Patrick Sawer, and the Army was deployed on to the submerged streets of Cumbria to help with relief operations. More than 360 flood alerts were in place across England, Wales and Scotland, including 20 at the most severe level, meaning there was a danger to life. The warnings came after forecasters said up to 4.7in (120mm) of rain could fall in some areas that were already saturated by wave after wave of heavy winter squalls. The Met Office also issued two red alerts for rain in the Lancashire area, plus for Yorkshire and the Humber. It is the first time two of these “danger to life” warnings – which advise people to “take action”, expect disruption to travel and to be prepared to evacuate their homes – have been issued in the same day. Eleven flood warnings were issued in Scotland, covering the Borders and Tayside areas. A Downing Street spokesman said David Cameron would visit flood affected areas tomorrow. The Prime Minister, whom officials said did not want to get in the way of rescue officials today, also announced that he would chair a meeting of the Cobra committee. Amongst the worst hit by the latest deluge was the village of Walsden, in the Calder Valley, West Yorkshire. King Street, its main road, was submerged and some residents were evacuated from homes by rescuers using boats as water levels continued to rise. Kellie Hughes, a hairdresser who lives in the street, said the situation was “a million times worse” than a fortnight ago, when the same road was flooded. Abbi Blackburn described how she was stranded in her home in Walsden as 5ft of water poured into the cellar. “It’s getting quite bad and it’s still walloping down with rain,” she said yesterday. “We didn’t have any sandbags. It started at about 6am. “We’ve lost two freezers, my washer and dryer. It’s at least 5ft deep down there. The Environment Agency rang up and said something about evacuation but we’re not leaving, we’re staying put. The nearby market town of Todmorden was also hit, with the floods continuing to rise as the rain kept falling. • That concludes our live blog coverage for today. Do return tomorrow for the latest updates. David Cameron will visit flood affected areas on Monday, said a Number 10 spokesman. In a Tweet, Mr Cameron wrote: "My thoughts are with people whose homes have been flooded. I'll chair a COBRA call tomorrow to ensure everything is being done to help." The Number 10 spokesman added that Mr Cameron would not visit today (SUN) to avoid getting in the way of the emergency services. There was a gas explosion at around 4.30pm in Radcliffe in Greater Manchester, which has been hit by major flooding. Saeed Atcha, a radio presenter, said: "All of a sudden we heard a bang, we looked over to where the sound came from and couldn't see anything. Then a second later there was another explosion and then a big orange beam lit up the sky, like a flash. "It was very, very scary. Everyone was looking around in a state of shock. "A police officer shouted 'Get back into your house, there has been a gas explosion'. "Two or three minutes later the police officer jumped into his and drove away. After he gave the warning he evacuated himself." Mr Atcha said he understood the explosion was caused by the flooding. It occurred right next to the River Irwell, which has burst its banks. He added: "It is going to be a very dark and miserable evening. It seems like the area is on lock-down." Greater Manchester Police said the explosion could have been caused by the flooding. It was caused by a ruptured gas main burning off and has now been dealt with, the spokesman added. Meanwhile in Leeds, a severe flood warning has been put in place for the city centre, with the River Aire expected to reach a record peak later on. Floods Minister Rory Stewart said that rainfall levels in the flood-hit areas were unprecedented. "We're looking potentially again today at maybe a month's rainfall coming in a day. That's falling on ground that's very saturated. As the rain falls, the rivers respond very quickly," he told the BBC Radio 4 Today programme. "I think this is why people are right to start focusing on uncertainty and why people obviously are very interested in the question of climate change." Travel woes on Boxing Day have been compounded by flooding as roads struggle to cope with the deluge of rain. North Wales has been worst hit, with drivers being forced to abandon their waterlogged cars in some areas. Would-be festive travellers near flood-affected areas have been warned by police not to travel unless absolutely necessary on a day when many train services are not in operation. With the ground already saturated, heavy rain over the past 24 hours has caused rivers to rise rapidly and the waterlogged A55 north Wales expressway is closed in both directions between junctions 11 and 15. The B5109 Llanfaes Beaumaris is also closed, as is the A5/A470 junction at Waterloo Bridge. There is also heavy flooding on the A487 Bangor and the road is closed from Vaynol roundabout up to the St David's retail park. The Highways Agency also reports congestion A663 southbound between the A669 and the junction with the M60 in Lancashire. Hundreds of people have been evacuated from their homes and thousands are without power after widespread flooding in the North West, with more rain forecast. Lancashire and Yorkshire have been hit by downpours, with people in a number of towns and villages forced to leave their homes after being stranded by rising waters. As of 4.20pm on Saturday the Environment Agency (EA) had issued 20 severe flood warnings - which signal "danger to life", while there were 225 flood warnings, meaning that immediate action is required. The Met Office also issued two of its most serious red weather warnings - danger to life - for the area. Residents in Whalley and Ribchester in Lancashire were forced to abandon their homes when flood waters poured through the streets after torrential downpours. Lancashire Fire and Rescue Service warned people to stay away from affected areas and told motorists not to drive unless they have to. Flood sirens sounded at Walsden, Todmorden, Hebden Bridge and Mytholmroyd in Calderdale, Yorkshire, as the water breached defences. About 10,000 homes in Rochdale and Lancashire lost their electricity supply after a main substation was damaged. Police in Lancashire have said that they have responded to 180 flood related calls throughout the day. The force added that many other flood-related calls were logged despite officers not attending. Meanwhile the Environment Agency reiterated warnings not to walk through flood water. Residents have been evacuated as a West Yorkshire town was cut off by several feet of flood water. Flood sirens alerted the town of Mytholmroyd, in Calderdale, to the rising waters at about 7am on Boxing Day. The centre of the town was completely under water, with residents worried levels would rise further as the rain continued to fall. One resident, who did not want to be named, said a man had to be rescued after he tried to drive a Land Rover into the water. He said: "He turned left after coming over the bridge and we just watched horrified as his car was dragged back towards us." The Environment Agency's Toby Willison has shared these charts, showing water levels at Hebden Bridge in West Yorkshire and Ribchester. Both places have seen a severe spike in water levels, with Ribchester at 5.71 metres. The Met Office confirmed on Christmas Eve that this will be the the wettest December on record for Cumbria since records began in 1910. Since 1 December many areas in Cumbria have experienced more than two and a half times their expected monthly rainfall. The Environment Agency has issued 20 severe flood warnings, meaning there is a danger to life, 217 flood warnings, meaning immediate action required, and 129 flood alerts. Cobra held another emergency meeting this morning in response to heavy rainfall overnight and to prepare for the downpours today. Environment Secretary Elizabeth Truss, who chaired the meeting, said: "Our priority throughout this period continues to be protecting lives, protecting homes and protecting businesses. "I would like to again to pay tribute to the tireless work of front line staff over the last month and the Christmas period, and the extraordinary resilience of the people affected, which I have seen first hand. "My thoughts and sympathy continue to be with people flooded out of their homes this Christmas and I can assure them we are doing everything we can to help communities recover from these storms." A 200-year-old former pub has been destroyed by flooding at Summerseat, Great Manchester. Part of the ancient building, which sits on a bridge over the River Irwell, was swept away in the raging waters. Resident Andrew Watson told ITV News: "The 200-year-old former mill and ex pub the Waterside has collapsed into the River Irwell at Summerseat near Bury, the road is now blocked and some of the building is blocking the River Irwell." A video shows water gushing under the bridge that supports the collapsed building. Lancashire City Council have told nosy-parkers to stay away from the floods. People going over to have a look is making it even worse, they say. Todmorden in West Yorkshire has also been hit and the waters are continuing to rise as the rain keeps falling. Lee Fraser, who lives on Halifax Road, said the road between the town and the neighbouring village of Hebden is submerged. "It's getting worse and worse, it's been raining really heavily since last night," he added. "The siren went off at about 7am this morning and 10 minutes later everything started flooding. "A lot of people are moving their stuff upstairs in their houses and the police came and closed the roads. "It's absolutely tipping it down, so it's only going to get worse by the look of it." Lancashire Fire and Rescue Service warned people to stay away from the Whalley and Ribchester areas and told motorists not to drive unless they have to. The number of severe flood warnings has doubled in the last hour as hundreds of residents were evacuated from their homes. There are currently more than 335 alerts in place across England, Wales and Scotland, including 15 at the most severe level. The Met Office issued two of its most serious red weather warnings - danger to life - for the area. Severe flood warnings were in place on Boxing Day, with at least two rivers bursting their banks and flooding nearby villages, as the Army were deployed on the streets of Cumbria to help with flood relief operations. Fifteen severe flood warnings - meaning that there is a danger to life - have been issued for the North East and North West by the Environment Agency (EA) as forecasters said up to 4.7ins (120mm) of rain could fall in some areas already saturated by wave after wave of winter squalls. The Met Office has also issued two red alerts for rain, which is deemed to be potentially deadly, in the Lancashire area and Yorkshire and the Humber. Eleven flood warnings have been issued in Scotland covering the Borders and Tayside areas. The River Calder burst its banks on Saturday morning, flooding significant stretches of the Calder Valley town of Mytholmroyd, in West Yokshire, including a Sainsbury's Local. The waters reached halfway up bus shelters and close to the bottom of first floor windows and dozens of residents have been evacuated from their homes. The River Ribble also burst its banks, flooding part of the Lancashire village of Ribchester. Both villages had been issued with severe flood warnings. The average rainfall for the whole of December in the North West is 5.7ins (145mm) – meaning close to a month's rain could lash the region in hours. Rory Stewart, the flood minister, suggested climate change might explain the current high levels of rain, which he described as unprecedented. Mr Stewart, whose constituency of Penrith and The Border, lies in the flood zone, said on BBC Radio 4's Today programme: "We're looking potentially again today at maybe a month's rainfall coming in a day. That's falling on ground that's very saturated. As the rain falls, the rivers respond very quickly. Certainly what we've seen is rainfall levels that nobody's ever seen before. "If somebody had said two years ago when we were designing these flood defences that we could get 13 inches of rain in a day, the answer from the engineers would have been 'Why are you making that kind of prediction? We have never seen this before.' I think this is why people are right to start focusing on uncertainty and why people obviously are very interested in the question of climate change." A red weather warning, the most serious alert, for heavy rain and flooding in Lancashire was issued by the Met Office on Saturday morning. People are being advised to move valuables and take advice from emergency services about evacuation. Around 115 flood alerts and 100 warnings were also issued by the EA, mainly for the North West, North East and Wales. A company from the 2nd Battalion, Duke of Lancaster's Regiment, helped committees across the North West build miles of temporary flood defences. The EA said 85 per cent of the country's temporary flood barriers had been sent to Cumbria, where rainfall has smashed records, and the Lakeland region braced itself again ahead of the deluge. Met Office forecaster Greg Dewhurst said the latest weather is "unusual" when the mild conditions enjoyed during December are taken into account. "And as you can see from the rainfall figures from this weekend alone it's very similar to what we'd expect across the whole month, so it is unusual to see such a prolonged unsettled spell," he said. The Government's emergency Cobra committee met on Christmas Day. Defence Secretary Michael Fallon said: "Even at Christmas our Armed Forces are keeping us safe. Once again they are responding to the Cumbrian floods with a commitment that can only be applauded." More than 700 Environment Agency (EA) staff are on stand-by to bolster flood defences as more sandbags and water pumps are rushed to Cumbria. Staff were setting up demountable flood barriers in Warwick Bridge, Braithwaite and Appleby with the assistance of the Army and teams were also dispatched across Lakeland to Workington, Glenridding, Kendal, Carlisle and Keswick. Major Nick Higgins of the 2nd Battalion told Sky News: "The people of Appleby and the surrounding area we have been operating in have been massively affected by these storms and it's important that we are here to help them." The deployment meant the soldiers were away from their families at Christmas, for the first time for many of the younger battalion members, but it was "a working day" with tasks to complete. "Today is business as usual," he added. Flood defence gates have been closed in Carlisle, Keswick and Cockermouth and the EA has transported over two kilometres of temporary flood barriers and more than 20 extra pumps to the north of England. Teams of workers from the agency have also been out checking and maintaining flood defences, clearing blockages in watercourses and monitoring water levels. The Met Office has issued an amber alert for the county, highlighting the increased likelihood of "medium impacts" from the rain, meaning some flooding of homes, businesses and transport links is possible. The latest deluge will come as towns and villages across the county are still clearing up the aftermath of Storm Desmond earlier this month, which left hundreds of homes and businesses under water. Around 40 roads and bridges remain damaged and closed, along with hundreds of homes left uninhabitable. Cluanie Inn in Inverness, Scotland, was where the most rain fell overnight, with 0.78ins (19.8mm) recorded between 5pm and 5am, a Met Office spokesman said. Elsewhere, the EA said that for the next three days along the River Severn in Shropshire, Telford & Wrekin and Worcestershire, and the River Ouse in York, there is a possibility of sections of roads being flooded, travel disruption and delays due to temporary flood defences being deployed. High tides are also expected, bringing with them the potential for large waves and spray along parts of the south and west coast of England. Sir James Bevan, chief executive of the Environment Agency, said that after the latest run of bad weather the agency will talk to the communities affected to look at how they can be better protected in the future. Labour leader Jeremy Corbyn also tweeted his thanks to firefighters, soldiers and EA staff, who said were "saving lives & homes". More information and help is available at http://www.gov.uk/check-if-youre-at-risk-of-flooding or follow @EnvAgency and @floodaware on Twitter for the latest flood updates. Traffic and travel information is available at http://www.cumbria.police.uk/traffic-link-map and a helpline has been opened on 0345 988 1188. I wonder if this guy has flood insurance? I'm putting together slide shows for weather disasaters. The small town of Hamburg, Iowa was submerged this week when its levee – the earthen barrier protecting it from the raging Missouri River – broke, forcing its 1,100 residents to flee their homes. But luck was on their side: No one died. And now this same raging river is rushing toward Kansas City, Missouri. 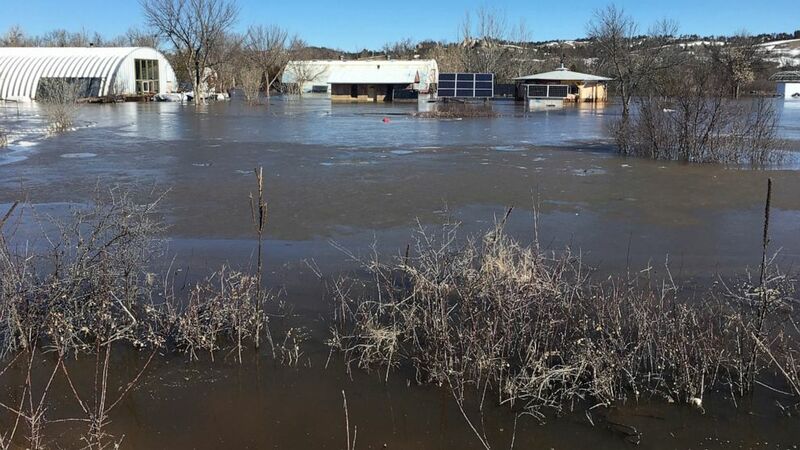 The Army Corps of Engineers warned during a Thursday briefing there could be other flooding as snow begins to melt along the upper regions of the Midwest. The states most likely to be affected: Iowa, Nebraska, Kansas and Missouri. "The runoff will be more than expected," John Remus, chief of the Missouri River Basin Water Management Division confirmed during the briefing. Twelve levees have already been breached, others have been "overtopped." And still others are in danger. "The public needs to remain vigilant." "The whole thing is trashed," said Pat Sheldon, who is president of a regional "levee district" that extends from Iowa to the Missouri border. He predicted that doing a "total rebuild" of his levee system alone could cost "several billion dollars." There are nearly 100,000 miles of levees across the country, protecting almost 150 million people, and when they fail, it can be disastrous. Others who've witnessed the misfortune of a levee rupturing weren't so lucky. The biggest tragedy occurred in New Orleans during Hurricane Katrina in 2005, when a dike that was supposed to protect the city gave way and 1,300 people died. And a recent Christmas flood in 2015 set records for water height all along the Mississippi. These disasters haven't gone unnoticed. In 2016, the U.S. Government Accountability Office (GAO), the Congressional watchdog, scolded the Army Corps of Engineers and the Federal Emergency Management Agency (FEMA) for making "little progress" in ensuring the safety of the nation's levees. 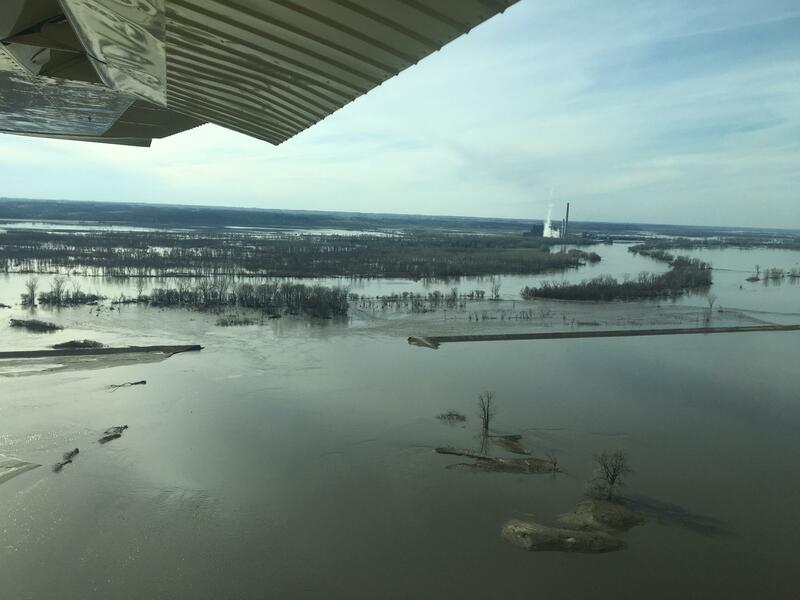 The Corps of Engineers, which inspects just a small portion of these earth and gravel barriers, said at least five percent were at very high risk of flooding. The Corps of Engineers controls just 15 percent of the nation's levees, while the rest are under state, local and tribal jurisdiction. But mistakes have been made regarding the levees the Corps of Engineers controls. When Hamburg built up its levee, Army officials ordered it be lowered. The flood water easily overwhelmed the lowered barrier wiping out the town. In New Orleans, the Corps of Engineers helped create a shipping channel dubbed "Mr. Go," but it ended up funneling Katrina's flood water into the city. And it's unlikely anything will change when the current flooding ends. "Extreme weather events linked to climate change are causing flooding that strains aging infrastructures and produces even more damage," says Executive Director Amy Bach of United Policyholders, a consumer insurance advocacy group. "Repairs don't garner attention because they aren't showy. There's no ribbon cutting." "You can't continue to maintain these levees on a shoestring," says John Dickson, a flood expert with Aon, an international insurance brokerage and consulting firm. "They were set up to fail." Is this enough "Less Goobermint!" for the Libertarians and the Radical Right? The storm moving east out of the northern Rockies Wednesday and Thursday could be similar to last month's . It will pack heavy snow and strong winds and produce life-threatening conditions in parts of the Plains and Upper Midwest, according to the National Weather Service. The heaviest-hit areas are expected to be from southeastern Wyoming through Nebraska and South Dakota into southern Minnesota. Snow is forecast to expand into parts of the Upper Great Lakes, with rain stretching from the central Plains east into the Middle Mississippi Valley and Western Ohio Valley. 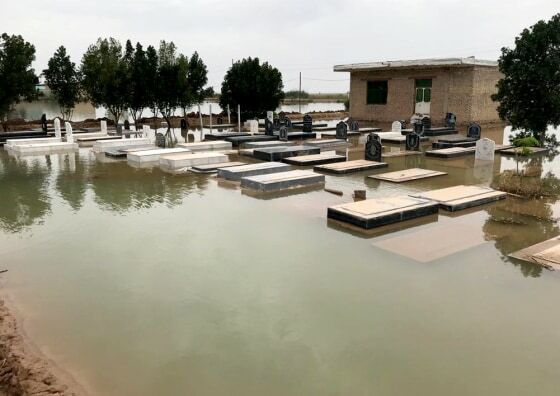 AHWAZ, Iran — Two weeks since the storms started, relentless rain and flooding throughout Iran has left some 2 million people facing a humanitarian crisis. The deluge has swamped large swaths of the country, from the mountains in the north down to the Persian gulf in the south. Twenty-five out of 31 of Iran’s provinces have been affected. Officials say say 76 people have been killed so far, with some 150,000 homes partially or completely destroyed. Bridges across the country and miles upon miles of road have been left unusable. Authorities say the estimated bill to repair the damage stands at least $2.5 billion. The country's agriculture sector, which makes up about 14 percent of Iran's GDP, has been devastated. In the oil-rich city of Ahwaz, in Khuzestan province, a local sports stadium is now home to rows of Red Crescent tents lined up next to each other. The aid group, the Muslim world's equivalent to the Red Cross, is working with the government to respond to the disaster. Image: People in a Red Crescent aid center in Iran. Hussein and Farideh Abdekhani, an elderly couple whose village was consumed by the floods, have sought shelter there for the past 10 days along with their daughter, son-in-law and two grandchildren. Farideh, a seamstress, told NBC News that the family had lost everything they had worked so hard for. “Between us we had two fridges, three heaters and a television. Along with our home, it’s all gone,” she said. “All we have left are the clothes we are wearing," she added, tugging the shirt her husband was wearing and pulling on her chador — a loose-fitting garment that goes over the head and down to the ankles, so as not to show a woman’s hair or figure. "We have nothing. I don’t know how we are going to rebuild our lives,” she added. In the nearby village of Hamidiyeh, farmer Jasem, 26, looked out at what was his once his livelihood. His family had spent decades building their family home and toiling on arable land. Now they fear they will never rebuild what they have lost. Jasem said he will move to the capital Tehran, some 600 miles from where he has spent his entire life, and try to find work in a restaurant. Twelve percent of the country's land is agricultural, like that which once proved so fertile for Jasem and his family. Amid desperation, the all-too-familiar blame game between two old enemies has continued. Iran has blamed U.S. sanctions for hampering relief efforts. "The heads of the American regime have revealed their true vicious and inhuman nature," President Hassan Rouhani said at a cabinet meeting screened live on state TV, according to Al Jazeera. Secretary of State Mike Pompeo blamed the Iranian government. "These floods once again show the level of Iranian regime mismanagement in urban planning and in emergency preparedness," he said in a statement earlier this month. "The regime blames outside entities when, in fact, it is their mismanagement that has led to this disaster." The Red Crescent are doing what they can to reach these often rural communities devastated by the floods, but damaged infrastructure has hampered their mobility. An aging helicopter bought by Iran before the 1979 revolution allows them to reach Lorestan province, a mountainous region in the country's west. Because of U.S. sanctions, Iran has been unable obtain parts for the aircraft over the last 40 years. Instead they have almost entirely rebuilt the choppers themselves. From the air, the scope and scale of the devastation are clear. What looked like massive lakes were actually vast villages and farmlands. Nasser, 81, a taxi driver in Khorramabad, the capital of Lorestan province, told NBC News: "I have lived here my whole life and have never seen anything like this." In the city of Pol-e-dokhtar soldiers from the army and Revolutionary Guard (IRGC) are leading the clean-up operation. Alongside clerics and volunteers they clear rubble, divert water, build dykes and distribute food, medicine and tents. One of the guards at a temporary station saw a van passing by with IRGC members on board carrying shovels. “Come and get some food, terrorists,” he shouted, an apparent reference to their recent designation as a foreign terrorist organisation by the Trump administration. This had seemingly become an ongoing joke among the group's members. But the city's residents were in no mood for jokes. 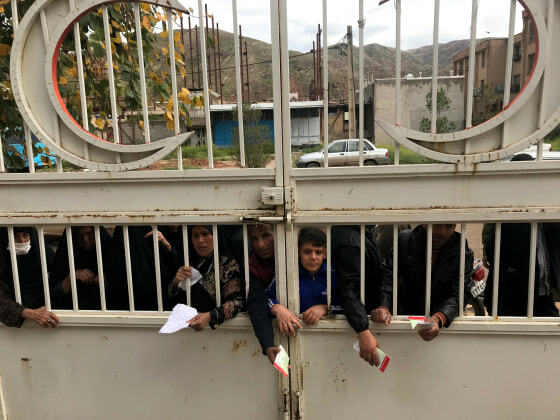 Frustrated at the recovery effort, many pressed themselves against the gates of the Red Crescent building screaming that they didn’t have enough food, medicine or tents. Some of those gathered in hope of aid had not been affected by the floods. Two women in their 60s, Sultaneh Imani and Shamsi Malekipoor, traveled from a nearby village despite being fortunate enough to escape the worst of the floods. Life was already so difficult, they told NBC News, that they were hoping get something, anything, from the aid group to help them get by. Poverty and discontent with the government run deep among some here, with the economy already struggling before the weather intervened. Many Iranians feel they haven't seen the economic benefits of the Obama-era nuclear deal from which President Donald Trump withdrew last year. While it allowed Tehran to sell its crude oil and natural gas on the international market, Iran's economy remains weak with high unemployment and inflation. For those who were already struggling, the floods have left many hopeless. A few miles from Pol-e-dokhtar, the small village of Baba Zeyd has only 530 residents. Once a breadbasket for the area, rich in vegetables and crops, it is now almost entirely destroyed. Its residents were in a state of shock. “Mother Nature cried for two weeks and we almost drowned in her tears,” said Mahin Fathi, a grandmother sitting outside the wreckage of her home. Her neighbor, the local lawyer, was angry. His home gone and his family's livelihood washed away, Khashayar Javadi told NBC News that the land was so badly damaged they won’t be able to sow crops or vegetables for years to come. The government has offered small interest-free loans to help villagers rebuild their homes, but Javadi wondered how they could pay the loans back with no prospect of making money anytime soon. “Our homes have been destroyed, our farmlands and livestock washed away," said Radoul, a farmer from the village. "I have no idea how we are going to make money. This was once a great place to live but now the future is uncertain, without prospects."